There is a very interesting column done in the mint today on the insurance policies which die due to lapsation or the product cost is too high. Insurance in India is still a huge commission based business what is interesting the lapsation ration is on the high-rise from the data collected. In insurance, customers return this product by either letting their policy lapse or by voluntarily surrendering their policy. In case of the non-linked business (term, group, health and endowment plans) for Birla Sun Life Insurance Co. Ltd, the lapsation ratio was as high as 72% for FY11. at the beginning and end of the year. So if the average number of policies at the beginning and end was 100, the number of policies lapsed was 72. 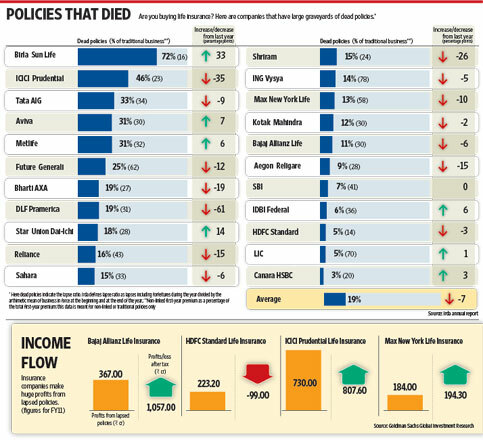 Surprisingly till 2009 around 80% of the industry was made up of unit-linked insurance plans (Ulips), but once the Ulip 2010 guidelines capped costs to an effective 2.25% over the life of the policy (over a 15-year period), the life companies tweaked their machines to produce and sell more “traditional” plans in which first-year commissions can still go as high as 35-40%. You need to participate in a contest for among the top blogs on the internet. I will recommend this website! Thanks $autor!Your share some great insurance quotesadvice,thanks for sharing all thissimple.I’ve subscribed your RSS feed to keep up to date,looking forwvard to your newtips!